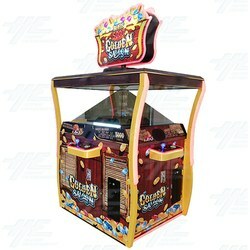 Golden Saloon by Universal Space (UNIS) is a virtual coin-pusher machine with a western tavern theme. Players must shoot coins to destroy items rotating on the tower. Destroyed items will turn into coins or gold bars and drop onto the pusher. Just like a real coin-pusher, players have the chance of winning by pushing coins and bonus items off the edge. Players must shoot coins to destroy items rotating on the tower. Destroyed items will turn into coins or gold bars and drop onto the pusher. Just like a real coin-pusher, players have the chance of winning by pushing coins and bonus items off the edge.